Considering the players involved, it’s hard to believe that Cubist Blues isn’t more widely known. Long unavailable and probably forgotten by all but the most devoted, the album is being exhumed from its tomb of obscurity next month, a rare and fascinating musical artefact that can finally be shared with the world. The record perfectly captures the magic that Alan Vega, Alex Chilton, and Ben Vaughn produced over a two day, improv binge in December 1994. The idea of a ‘supergroup’ getting together to make an improvised rock album made up of rockabilly, jazz, and blues influences won’t necessarily appeal to everyone. And with good reason - ‘supergroups’ often have a bad habit of haphazardly squashing their influences together into one big, indistinguishable mess. Yet, Cubist Blues bucks that trend in a big way. The three players here work seamlessly together and have produced an album imbued with a genuine sense of freedom and adventure. It’s also true that while the album is undeniably experimental in nature, there remains a strong thread of soaring, melodic rock running through its core. This influence is arguably down to Big Star’s Alex Chilton, a man so admired in the rock community that The Replacements wrote a song about him. Opening with the eight-minutes of surf guitar and railroad rhythms that make up the sprightly ‘Fat City’, the tone is set from the beginning. Vega croon’s, moans and slurs like a psychobilly reincarnation of Elvis Presley, yelping about hell trains, blues and “getting hammered”. 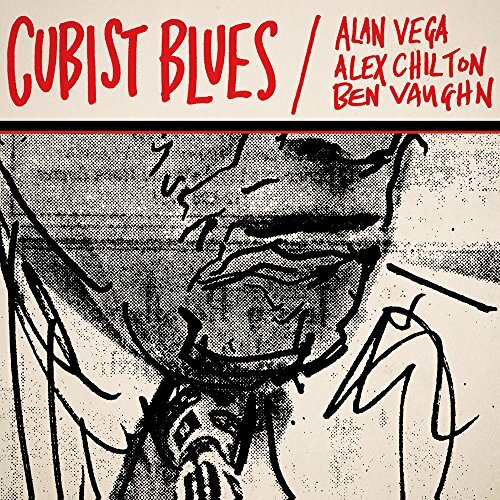 While still recognisably Suicide’s Alan Vega, the vocals on Cubist Blues sound free and fantastically unconstricted. Vega is utterly in his element; the shades, swagger and self-belief of a genuine rock ‘n’ roll star. An early highlight comes in the form of the towering, ‘Freedom’. Synth drones rumble and shimmer on the back of a steady beat as a loose, melancholic guitar slides gracefully through the fuzz. The song feels like a long lost relative to one of Springsteen’s paeans to the shattered American dream as Vega croons about lies, promises and freedom. A resigned yet hopeful ballad that seems to breeze through its lengthy running time with ease. The album really translates that loose, fun feel that comes from improvisation; shifting through styles in a relaxed, natural fashion. Take the jazz piano boogie of ‘Lover of Love’ and then give the synth fuzz nightmare of ‘The Werewolf’ a listen; the connecting influence being Vega’s slurred vocal presence. ‘Candyman’ is ridiculously exciting with a simple, clean riff leading the charge as amps sing with feedback prayers and Vega struts and warbles across the bands sonic stage. You can certainly see where Jon Spencer picked up a few ideas. As a nod to Vega’s more well-known venture the album closes with ‘Dream Baby Revisited’, a messy but fun mini-ballad that casts Vega as a barroom crooner. Ultimately though, Cubist Blues isn’t really about Suicide or Big Star, it’s an album that successfully captures a moment where three musicians really connected with each other and made some truly impressive music. These songs deserve to be heard by more people.